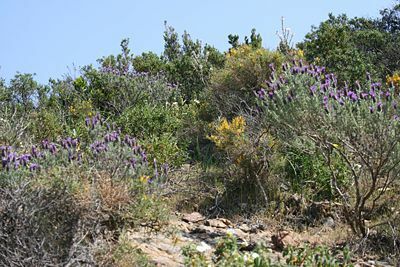 Garrigue is a plant community formed of prickly shrubs that are drought resistant. This community is the consequence of the deterioration of green and white oak forest to Aleppo pine, and then garrigue caused by sheep grazing, man and fire, since post-glacial global warming. This evolution is characteristic of Mediterranean regions. Garrigue forms on calcareous, dry and porous soil. A maquis forms on siliceous soil. In France, there are 400,000 hectares of garrigue in Provence and Languedoc.